Learning Heptapodese seems easy compared to the tough talks Americans need to have with each other. With Arrival, Villeneuve finally finds a subject, and a script, whose magnitude matches the weight he assigns to it. All it took was an alien species' appearance on Earth. Those expecting a whiz-bang film should be prepared for a more cerebral and emotional experience, admirable for its ambition and tone, if not wholly satisfying in its payoff. Arrival plays with your head as gently as any sci-fi thriller I can remember. Denis Villeneuve's latest is an artier - certainly moodier and less entertaining - version of M. Night Shyamalan's Signs. It's difficult to get worked into a state of awe with this film because so much of it is so sodden. Amy Adams is a miracle worker-she makes us believe in this mesmerizing mindbender about alien communication, directed with searching mind and heart by Denis Villeneuve. A twisty, cerebral drama that just happens to involve aliens, Denis Villeneuve's film is a truly beguiling take on both the sci-fi canon and what, exactly, a grown-up Hollywood film is supposed to be. It doesn't pack the punch you'd expect from an alien invasion movie; it aims higher, and in the end, it cuts deeper. [Villenueve has] a keen appreciation of film's ability to get at hidden truths. By turns inviting and opaque, Ms. Adams turns softness and quiet into heroic qualities, keeping her voice low, modulated, and using stillness to draw you near. Arrival, like the Spielberg classic it aspires to, brings the beyond to us. In doing so, it asks a challenging, prescient question: Are we ready to teach, and ready to learn? Arrival is grand, technically marvelous, solemn, spooky, somewhat unbelievable and sometimes unfathomable. Who is to say alien visitation will be any different? "Arrival" makes a moving case that we've only scratched the surface of what we think is possible - and what we define as intelligence. If you're yearning for a smart, thoughtful sci-fi film that wonders how first contact with aliens might go down, this tight little gem of a film is a gift from beyond the stars. It is simultaneously old and new, revisiting many of these alien-invasion conventions but with unexpected intelligence, visual style and heart. What's remarkable about Arrival is its contemplative core -- and, of course, Ms. Adams's star performance, which is no less impassioned for being self-effacing. A familiar story about a close encounter, though well crafted and unusually moody. By the time it ends, Arrival is a story that could only be told in the science-fiction genre, and the result is a beautiful narrative that you find has been telling you things about itself without you ever realizing it. Fine, full-bodied filmmaking, with a sense of the alien-ness out there in the universe that flatters our intelligence while making us feel tantalizingly small. Arrival is not a linear adventure of the mind, and it is a film probably best seen twice. Muted, measured and meditative, "Arrival" brings taste and restraint to a genre in the midst of a mini golden age: It comes in peace. Working from a screenplay by Eric Heisserer, director Denis Villeneuve creates a richly imagined world in which the theme of extraterrestrial outreach is addressed with a refreshing dignity. [A] terrific, haunting film that plays with our expectations - and rewards us with satisfying left turns. Villeneuve draws on Close Encounters of the Third Kind for his portrayal of scientists and soldiers groping for answers and, more generally, of the celestial playing out in highly personal terms. An alien-invasion fantasy that operates within the genre at the same time as it subverts it - large-scale movie-star sci-fi filtered through the tricky, esoteric lens of art-house cinema. "Arrival" is the sort of superficially profound movie that initially seems deep and weighty but stops making sense the moment you put down the bong. How many sci-fi movies actually give you ideas to argue about anymore? How many sci-fi movies give you ideas at all? 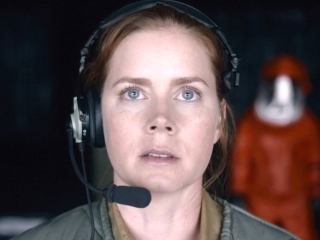 Arrival is at its best when pregnant with the suspense of the possible, when the unidentified stationary objects bear no trace of their intentions. But the film becomes less intriguing as the story's direction moves from teasingly opaque to crystal-clear. Arrival has come, like a visitor from the cosmos, to blow minds and break hearts. So much of the pleasure of Denis Villeneuve's poignant science-fiction drama "Arrival" lies in watching Amy Adams figure things out. If Arrival succeeds at the box office, it will shine as a beacon in favor of not dumbing down every production to appease the distracted and disinterested masses. Arrival is at once majestic and melancholy. It's a grand endeavor, and Adams, at the center of it all, brings pluck and smarts and a deep-seated sorrow to her role. This is her movie, no doubt. [Adams] delivers a heart-wrenchingly beautiful performance using her ability to communicate a half-dozen emotions just standing still... But director Denis Villeneuve sometimes gets lost in repetition and blind alleys. Arrival is a weird flick, slow and tedious, too metaphysical for Rod Serling's The Twilight Zone and most likely to appeal to people who like to play video games and solve puzzles. Adams is convincing and smart-seeming, bringing appropriate queasiness to the position of being a college professor drawn into a rough military world. Arrival arrives at a good time, as something of a salve for the ugly discourse going on and a reminder to us that thinking big is really worthwhile. The sci-fi thriller not only subverts expectations in brilliant ways, it explores deeply felt themes of life, loss and love. In other words, it's light-years away from Independence Day 3. Arrival is such a beautiful and thought-provoking film that it almost singlehandedly makes up for every bad aliens-coming-to-Earth film you've ever seen. Much of Arrival - the part that sticks closest to its source, egghead sci-fi cult figure Ted Chiang's "Story of Your Life" - is an eerie, tantalizing, altogether superb puzzler. Arrival has its heart in the right place. Who doesn't want smart sci-fi? Who wants to argue with a big budget drama about linguistics? And though the film is not more than sum of its parts, well, those parts are pretty great. Given that personal trauma is the prevailing throughline of Denis Villeneuve's filmmaking career so far, it's no surprise to find Arrival anchored by a familiar narrative motif. So sure is the stride of the narrative, and so bracing the air of expectation, that you feel yourself, like Louise, beginning to spin, and barely able to catch your breath. For most of its running time, Arrival is entrancing, intimate, and moving - a sci-fi movie that looks not up at the stars but rather deep within. An outstanding sci-fi film with an intergalactic language lesson. A film that forces viewers to reconsider that which makes us truly human, and the impact of grief on that timeline of existence. Less Close Encounters of the Third Kind and more Linguistic Encounters of the Academic Kind, this is a sci-fi movie with intelligence, cerebral and emotional. Compellingly made, this is science fiction of substance, which is promising for the forthcoming new Blade Runner. Plenty of smart ideas and bravura visuals. Arrival gives us a lot to take in, and the picture is big, somber and grand, if in the end somewhat sterile. Both heartfelt and very entertaining. Anchored by an internalized performance from Amy Adams rich in emotional depth, this is a grownup sci-fi drama that sustains fear and tension while striking affecting chords on love and loss. A fairly chilly, cerebral bit of business, from its beautifully tamped-down cinematography (by modern master Bradford Young) to Jóhann Jóhannsson's ethereal score.